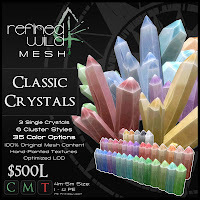 Crystals, Crystals and MORE Crystals! Oh, and Signs. In-action crystal snapshot from Relay for Life. As you can probably guess, I had many inquiries about whether or not I'd be putting my new assets from the Relay for Life event up for sale. My simple answer was: Of course! 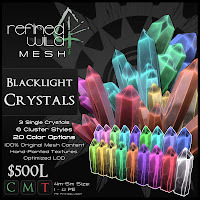 You can now purchase the Crystals in 4 flavors: Classic, Blacklight, Pastel and Dark. 85 colors in all. 6 cluster styles (ranging from a 2-4 Prim Equivalent, depending on the cluster) and 3 single crystal styles (1 Prim Equivalent each at rezzed size). That's a total of 765 separate crystals. These things can be sized UP HUGE or shrunk down really really tiny. 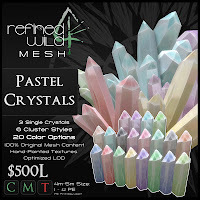 You can mess with the shine, the glow, and even make your own clusters from the single crystals. Click on the one you like to take you to the Marketplace! I've also packaged up a nice healthy grouping of the Wooden Signs! These things are pretty neat, due to the fact that I've used multiple materials on extra faces I've placed on the front of the signs. 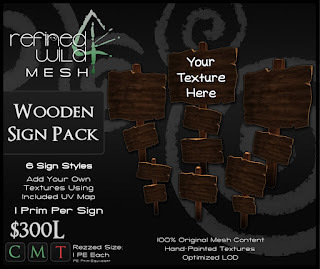 This means, by using the included UV map, you can put your own textures on the signs. Whether or not you need them for instructions, to dispense items, simply to keep people off your lawn or to tell people to "Turn Back!" from your haunted forest, these signs probably have over a hundred uses. Since you can customize them, it's your license to be creative! Stepping stones will be released a bit later. 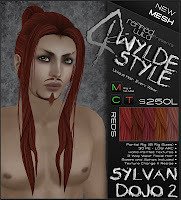 I've decided to spend some time working on Wylde Style. It needs an entire overhaul. 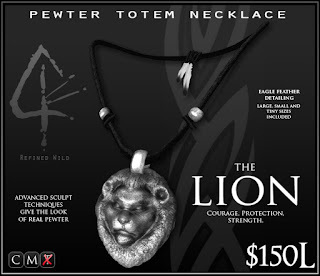 Not to mention some stellar new items. 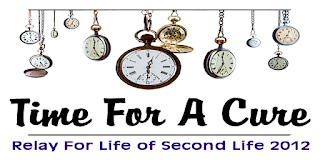 Click on the banner for the Relay for Life Second Life website. 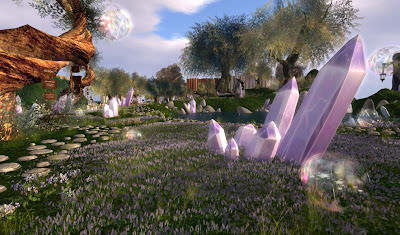 Relay for Life in Second Life 2012 ended with a donation total of $348,919. And no, that's not Lindens. I think everyone was pretty happy with the general outcome this year. While this year was quite a bit less than last year, repeating a donation of over a quarter of a million dollars is definitely nothing to sneeze at. 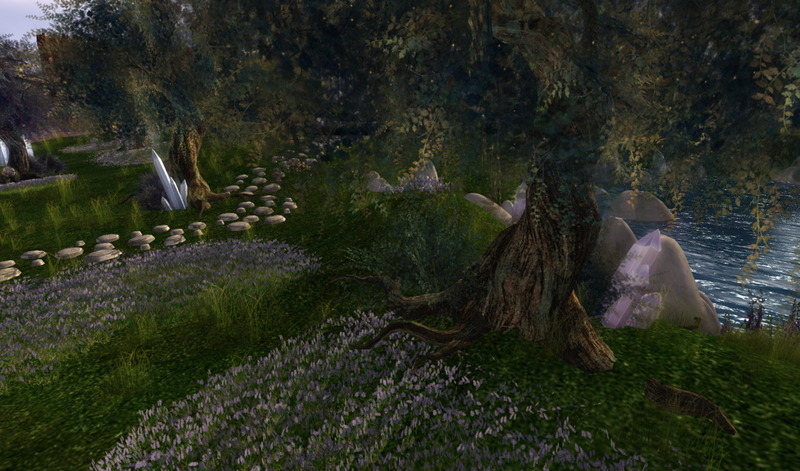 A lovely view of the path into the Second Life Relay For Life Committee campsite. 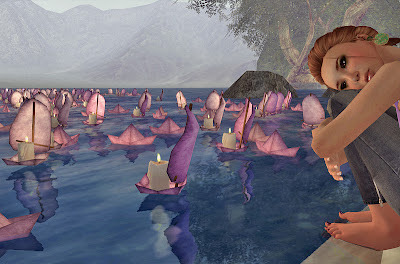 As I explained in my last blog post, I had been asked to bring back "Paper Boats in a Paper Sea" for the main Relay for Life event in Second Life. I think I under-estimated exactly how much it would take to fill 1/4 of a sim without making it look like my shop and art display exploded all over a parcel. I had decided to create custom content for the event. I also had to display the names of the committee members, somehow. Since I had a strange corner parcel that worked best at a diagonal, I had to wait until I actually saw the parcel in-world before I could begin designing my display. I sketched my draft the day the sims came online. I had 9 days to complete it. Issues began cropping up immediately, importing sand sculpts. The technique I used for the Fantasy Faire display, for some odd and unexplained reason, was no longer functioning. Not that this is a surprise. 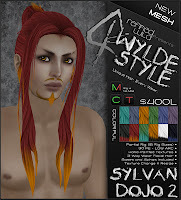 We're in Second Life, after all. I ended up scrapping the sand and decided to just terraform instead. To make matters worse, the entire week we struggled with crippling lag and repeatedly crashing sims. A few times I had to retreat to my Home sim to complete assets and position objects because I could not do it on location. A group shot of my slav — er, minio — er, helpers and I. From left to right: Iloh, myself and Saikatsu Epsilon. Admittedly, most of the time working on the parcel wasn't creating content for it, or managing out how the interactive display would work. It was setting out all the bleeping grass. Grass, stepping stones, flowers, trees. Landscaping. At one point my two helpers (Iloh and Saikatsu Epsilon) and I did nothing for several hours but set out grass. The lag certainly didn't help. Eventually Iloh shoved me aside and decided to take about 75% of the gardening into her own hands, if not more. Thank goodness, too. She did a stunning job! 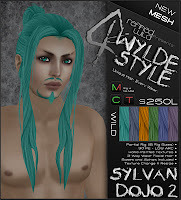 I love making Second Life look not-so-much like Second Life. 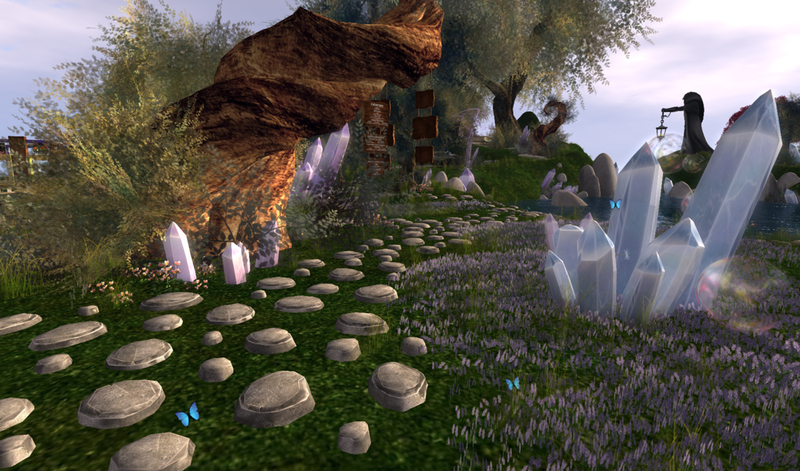 While I'd never seen Iloh do any landscaping before in Second Life, it was as if it came second-nature to her. With minimal instruction and critique on my part, she managed to help churn out exactly what I needed. It took a lot of stress off the fact that I was sleeping in 4-hour chunks and working in 8-9 hour intervals. Turned to the most attractive angle. 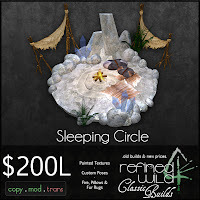 I made several clusters of stepping stones, customizable wooden signs and some of the most beautiful crystals in Second Life from scratch. All low-prim and customized Level of Detail for optimal performance. I coordinated the positions a few of my sculptures and my new Dancer's Triad. 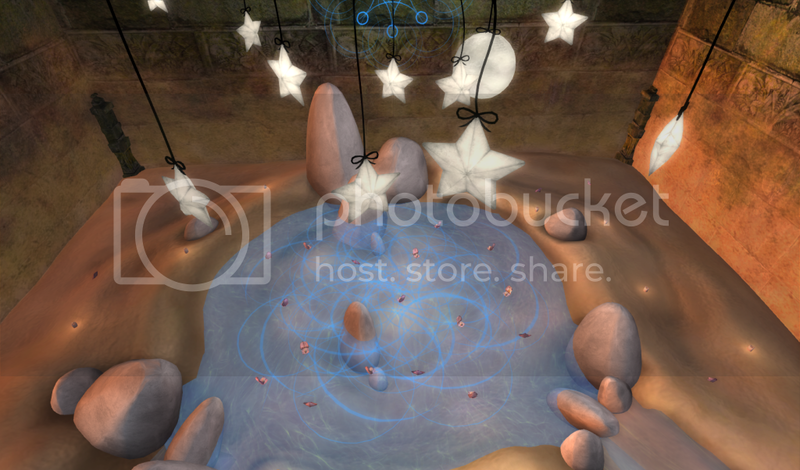 Rocks, plants, particle effects. The finishing touches on the installation itself. We decorated the seating areas with 'chairs' in the form of floating bubbles by HPMD*, and put out some of their wonderful trees and bushes. 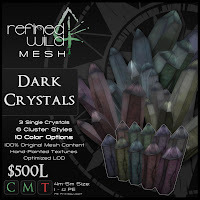 The crystals were a mad dash (I created them in 8 hours) but they were worth it. They definitely tied everything together. The last object was placed at 5:56 AM July 14th. 4 hours shy of the start of the event. Surprisingly, I managed to stay awake and coherent long enough to witness the opening of the event. Then I took a 12-hour nap. 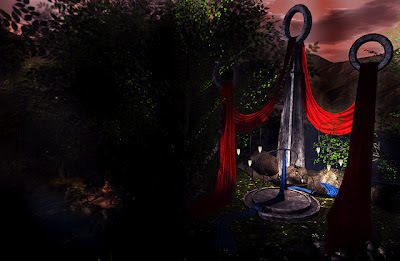 I have officially nine days to finish my display for Second Life's major Relay for Life event. I have never done this event before, and I am stoked. 40 sims large (that's a lot of sims) and packed with artistic displays and themed events, users follow a gigantic track that spans through the sims in a large circle. Users continue to raise money and follow the track over a 24 hour period. I've been invited to display on one of the major campgrounds along the side of the track. Once more, Kadmon Wytchwood and his incredible scripting talents is making sure "Paper Boats in a Paper Sea" can return for the 24 hour event! 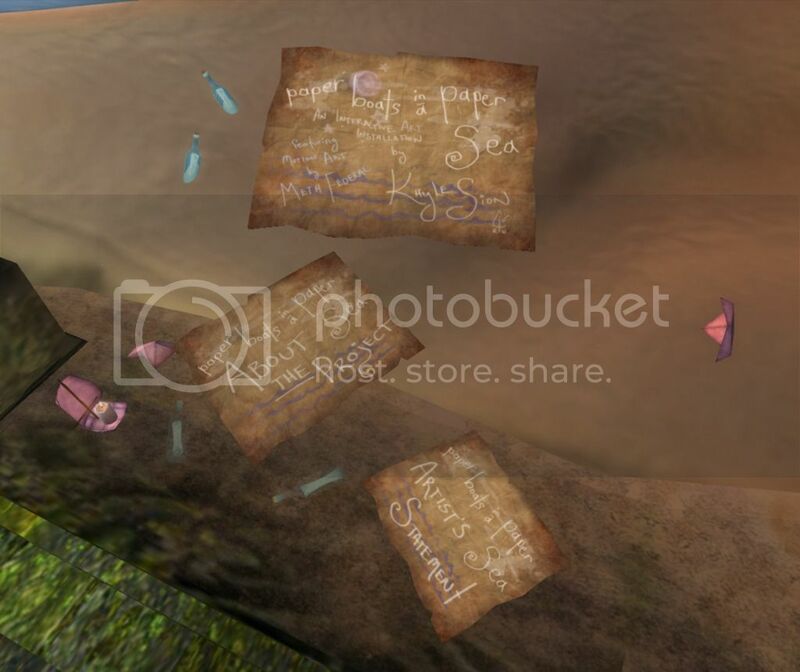 As the event only lasts a day, people won't have enough time to customize their own boat textures, so the boats are being limited to a dedication that will broadcast over instant messages. After you make your donation to the vendor and receive your boat, you'll be able to wear your boat and click on it. This will rez a boat that will go out on the water. Follow the instructions to make your dedication with a chat command, and click on the water to place your boat. The boat will then remain on the water until the end of the event. 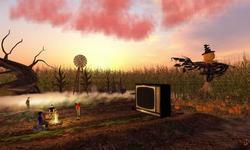 If there is one grid-wide event that I can completely get behind, it's Relay for Life in Second Life. 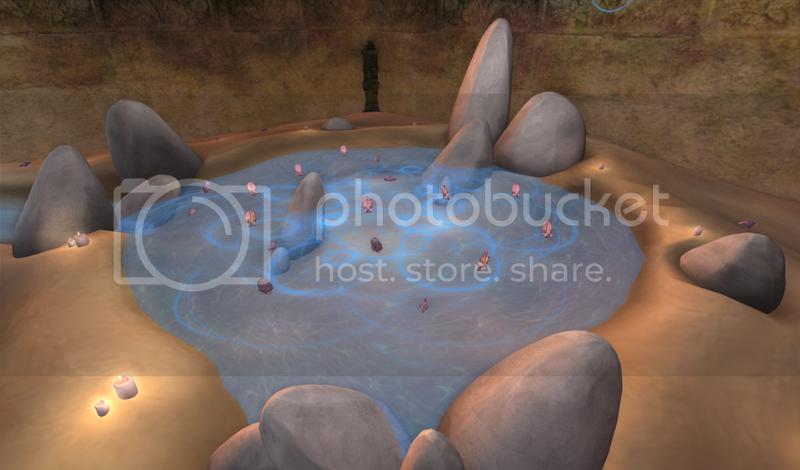 Many donation events in Second Life are questionable in terms of where the donations actually go. There are quite a few individuals who have used donation events in Second Life as a means to scam residents, taking their money for charity and transferring it right into their own bank accounts. Relay for Life in Second Life is one of the handful of charity events that are not only backed by the American Cancer Society, but use very specific donation vendors that go directly to their custom-legacy-name avatars (in other words, avatars with last names given specifically by Linden Lab), which you can obtain from the American Cancer Society's very own in-world sim. 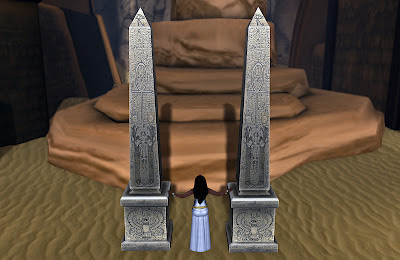 If you're interested in joining the in-world event on July 14-15th, be sure to check out the Relay for Life in Second Life website. It's sure to be a lot of fun, with themed walks every hour and prizes for most outrageous costume or how many times you can lap the track in the 24 hour period. Oh, and I almost forgot! The Nightly Netting from my Relay for Life: Fantasy Faire 2012 display is now on sale. I'm not exactly sure when I'm going to get the skybox finished, as it's been giving me 'issues', but we'll see once this current event is over. 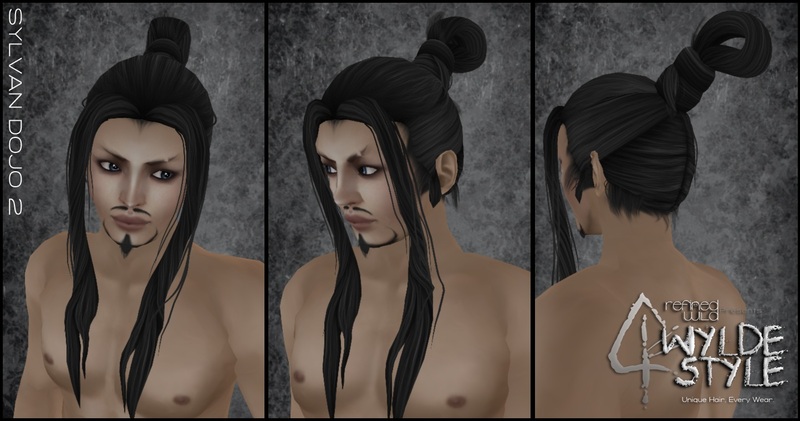 I also released the lanterns from my 'Dancer's Triad' separately and seemed to forget about announcing it. They're $30L for a set of 3 sizes. 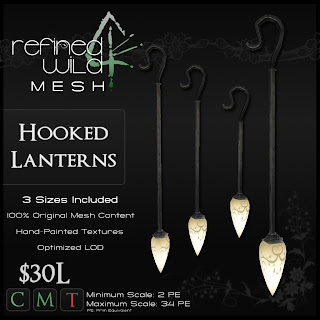 So if you need some cheap mesh hanging lanterns, they're definitely something to pick up. 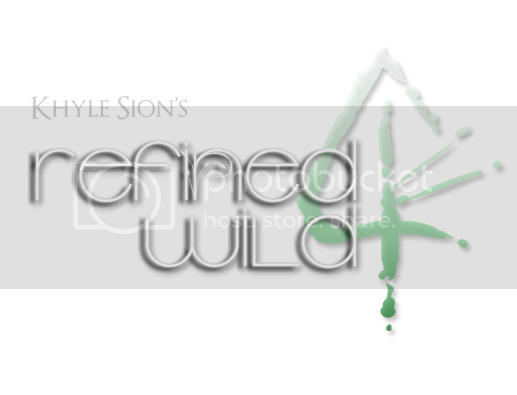 "Classic" Is The New "Cheap"
So I've been doing some re-pricing and marking down of older Refined Wild builds that were created somewhere between 2005 and 2008. These builds were top quality for their time and sold very well over the course of several years, but I think it's about time they get demoted to prices that better reflect their current quality in accordance to the rest of the market. Of course, this means good news for the thrifty people out there who like to get quality stuff for a fraction of its original cost! Considering that I've been making stuff in Second Life for such a long time, over such a long period of time, the age gaps between pieces can become pretty apparent. At least to me, anyway. I may or may not make more aging pieces 'Classic' as time goes on. 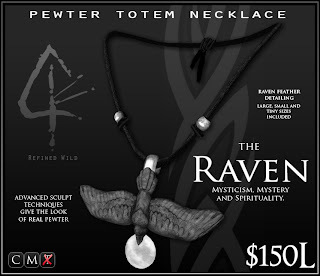 I think it will really depend on the quality of the piece and whether or not the price fits the form anymore. 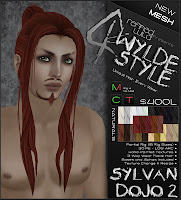 I will eventually be doing this to a handful of my older Wylde Styles, as well. Which ones and when? Only time will tell. 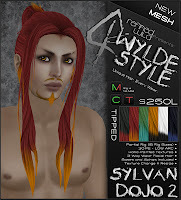 Click on any of the above advertisements to hop to the Second Life Marketplace listing. Elysium finding a message in a bottle. Elysium Hynes was assigned to be one of my bloggers for the Relay for Life Fantasy Faire this year. 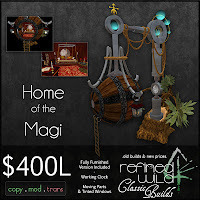 I was quite impressed with her blog when I was introduced to it, and I was undoubtedly impressed by the work she put into documenting my project and my items, both for the Faire and otherwise. You see, last year I wasn't all that impressed with how my items were covered by my assigned blogger. In fact, it was my only qualm with my experience of the Faire. It felt like the blogger was only really doing it to fill up their blog, pad out their content and really didn't want to have any fun with it. 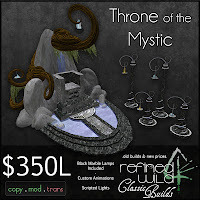 Elysium completely re-instilled my faith in the bloggers for the event, and absolutely won me over with her creativity. 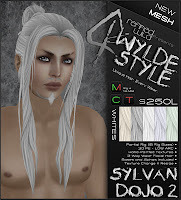 Now, I'm not really an individual who's 'into' the Second Life blog scene, but I've seen my share of good Second Life blogs, and really awful Second Life blogs. 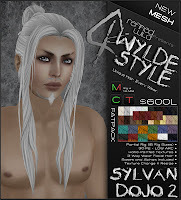 Elysium is apparently very new to the scene, with her Second Life fashion blog 'Sium', but she's already been grabbing quite a bit of attention. I can understand why. She documents well, and her 'SLtographs' are absolutely amazing. From her blog post here. I am wowed by this image. 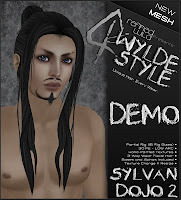 It doesn't even look like Second Life anymore! had turned out with this many boats, it still would have lacked the beautiful reflections. 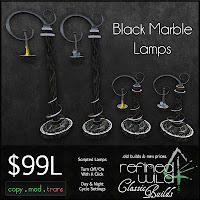 but it makes heavily textured items look intense! 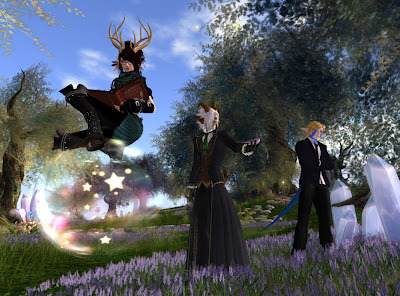 I really think, as a blogger, Elysium went above and beyond anything I had expected for the Faire this year. She took what I had, had a blast with it and turned around with exciting and visually-delicious content. I really hope she'll want to work with more of my stuff in the future, if just for the fantastically lush photos! Once again, check out her blog: Sium. She's going places. You'll want to be there when she gets to her destination. 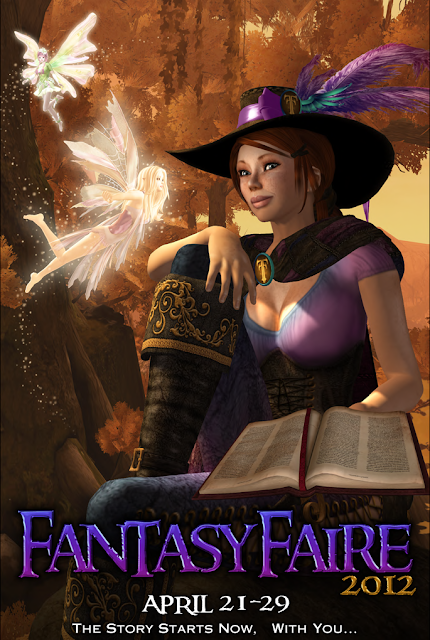 The Relay for Life: Fantasy Faire 2012 is now over and everyone must wait a whole year for the fun to begin again! We managed to raise over $25,000 this year, which I believe is at least a couple thousand more than last year, and we certainly broke (and set!) a couple of new records this time around. As many of you know, this year I did a public art piece called "Paper Boats in a Paper Sea" that was integrated into my shop's display. 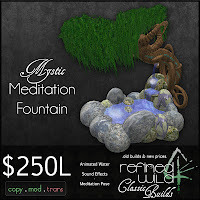 I collaborated with Meth Federal, a mind-blowing abstract movement artist to create one of the most beautiful features (in my humble opinion) of the Faire this year. Information posters for the art project. 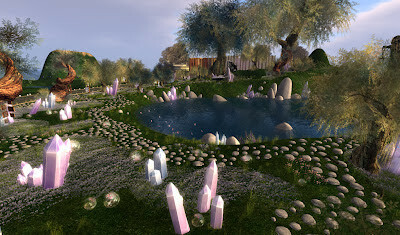 The project was featured on the Fantasy Faire's website blog. Elysium Hynes, who is this fantastic person and wonderful blogger I've had the chance to meet and chat with over the course of the Faire has blogged my project several times at different stages. She really went above and beyond anything I've seen bloggers do for the Faire. Prazillo Lemon also did a fantastic job blogging the project. Even Jackie Mondalimare wrote a short story surrounding the little paper boats, to my absolute amusement! The response and feedback for the project was really astounding. I didn't get nearly as many boats back for the display as I had sold, but I certainly got enough boats to fill the pond enough to the point where I was completely satisfied with how it turned out. The boats that did sell raised a good L$30,000 (about $110 USD) and combined with the beautiful abstract art that Meth sold, we raised a really decent amount of cold, hard, cancer-curing cash! 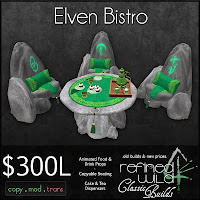 Which is always impressive, especially when you're selling a combination of art and Faire-specific items. The tiny Paper Boats in their little Paper Sea. Everyone who painted their paper boat to take part in the project did so with such admiration, love and care. We had drawings, memorials, and poems; even an advertisement and a public statement about the health of the earth and how to process your trash! I really wish more people had the time to customize their boats and have it take part in the display. I know that a couple of people had a really hard time writing or drawing anything out, as it was so incredibly emotional for them. I admire that they managed to submit anything back to be displayed. It really does take a sense of strength to put a piece of yourself out there for the world to see. Bird-eye view of the display. It was a little hard to take photos, with the shop's structure getting in the way. In the near future, I will have parts of the display for sale. 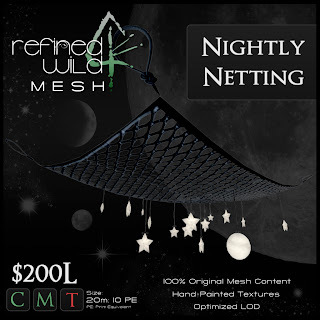 It might take a bit longer for the hanging net (as I forgot to take it back into my inventory after I was done taking photos! 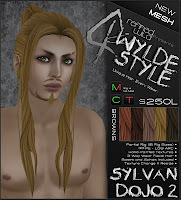 ), but I will also release along with it a skybox (yes, a skybox!) of the sandy display, itself! Unfortunately, it will lack Meth's "Eclipsing Ripple". However! 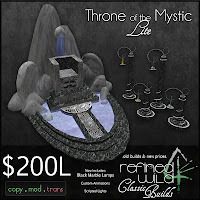 You can certainly obtain it from his Second Life Marketplace.